On March 13, Nordic Centre will host a quiz night in which participants can test their knowledge of China, the Nordic countries, and a few surprise categories. Nordic Centre co-organized this public event with Yangpu District Women's Federation, Fudan University Women's Committee and Heyi Tech Company. On 14th December, Nordic, Chinese and international students came to Nordic Centre to celebrate a traditional Nordic Christmas. Co-organized with Association for Norwegian Students Abroad, ANSA, we opened our doors for a Nordic Christmas celebration where glogg, lusekattar, cinnamon rolls and ginger breads were served. The highlight of the evening was when Santa Claus came and delivered out a present to those who had brought one to the party. Some had wrapped up a box of chocolate and went home with a hand cream. After Santa had emptied his bags, he made the participants sing carols where the last song was Wham’s classic, Last Christmas. With over 150 people present at the event, the building was shaking when everyone sang together. ANSA and Nordic Centre wish everyone a Merry Christmas and a Happy New Year! 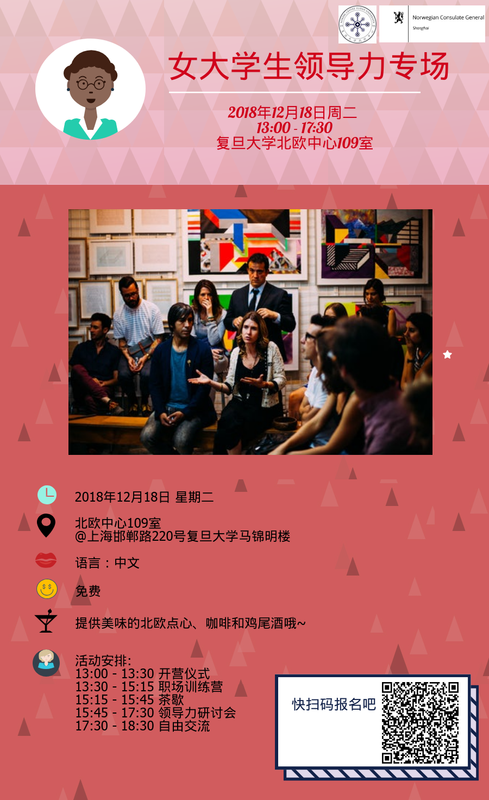 As the first non-Chinese presenter to speak at Yangpu Library, on December 9 program manager Magnus Jorem gave a one-hour lecture in Chinese about Nordic lifestyle in relation to sustainability. Nordic Centre organized lectures and company visits for exchange students from University of Gothenburg. Staff of Nordic Centre introduced the organization, activities and summer courses to the delegation of teachers and students from University of Turku. On November 12, Nordic Centre arranged its semester quiz where the participants’ knowledge about the Nordic region and China was tested. The winning team consisted of two local Chinese and two students from two different Nordic countries made them the perfect team. Lectures about Chinese economy and business development for students from BI Norwegian Business School. Please read the separate conference page for more information. Every summer, Nordic Centre organizes two summer courses, each lasting two weeks and featuring a mix of lectures and excursions to professional environments such as consulates and company headquarters. Besides lectures from the main instructor, you will interact with a range of different business people and academics. Come join us for waffles and coffee the first Thursday of every month! Join us for a traditional Chinese tea ceremony at Nordic Centre! Ren Yuan, Fudan University, Professor of Demography and Urban Studies; School of Social Development and Public Policy; Vice Director and General Secretary, Fudan University Yangtze River Delta Institute; Deputy Director, Institute of Population Research; Vice Director, Center for Urban and Regional Studies. Stein Kuhnle, University of Bergen, Professor of Comparative Politics, Department of Comparative Politics. Four public lectures on gender-themed topics. It is possible to attend individual lectures. The Nordic welfare states (NWS) and their model of elderly care provision will be introduced, as well as its relationship to state feminism and how transnational discourses on neo-liberalism have been translated into this context. Despite their commitment to (gender) equality, gender issues continue to be a topic in relation to elderly care in the NWS regarding the recognition of care work and professional care. The post-2008 era has seen a variety of protests and resistances against economic restructuring and increasing inequalities across Western Europe. In Sweden protests around a restructured housing market and gentrification has taken centerpiece in the literature. This case study considers the role of place history in the political mobilization that have gathered momentum over the past three years in the county of Västernorrland, northern Sweden, in response to the restructuring of the public healthcare services, affecting the maternity ward and emergency care at one of three hospitals. Women’s equality as part of the labour market in the Nordic countries rests on policies with an ethos of welfare. High employment rate is not least achieved through the high ratio of women’s participation in the labour market and the parental leave policies practiced in all of the different Nordic countries. This presentation will focus on women´s role in the labour markets across the Nordic countries from statistics and maps recently published in Nordic Council of Ministers State of the Nordic Region 2018. This lecture will examine public debates around transnational adoption beginning in the early 1960s and onwards. Pro-adoption discourses and the interests of adopters dominated the debates until the 1990s when adult adoptees began to form communities of their own and voice criticism of the conditions facing adoptees of color in Denmark. Today transnational adoption continues to command support across the political spectrum but in recent years politicized adoptees have worked to assemble critical interventions that seek to undermine the moral legitimacy of transnational adoption and imagine a world where other forms of care arrangements are valued. The Royal Danish Academy of Music is a power centre in the classical music world, representing the highest international level and compares to and cooperates with a number of the foremost music academies in the world. The academy offers study programmes within music and music pedagogy at the highest level, taught by a corps of teachers, numbering several of the greatest names in music, including many international capacities affiliated as guest professors. The study environment is very international and is characterized by a healthy competition accentuated interaction between the students, Danish as well as international. The academy offers a wide selection of study programmes at bachelor, master and advanced postgraduate soloist level aiming at employment as musicians, organists, composers, music teachers, tonmeisters or other employment possibilities within the music world. The advanced postgraduate programmes improve the students' level to the highest possible as soloists, opera singers, composers or conductors. As a metropolitan academy RDAM has a comprehensive network of collaborators that in a decisive manner enriches the study programmes as well as all other activities. Internationally the academy co-operates with leading academies in Europe, USA and China and on the national scene the collaboration includes the other artistic educational institutions under the Ministry of Culture and several leading universities. Register as an audience here, participation is free of charge. Note: Please turn off your VPN during registration. Human life expectancy has increased dramatically over the past centuries. Today we can expect to live nearly 50 years more than in the 18the century. Better public health, better food safety, food security and diet are some of the main causes for the populations living longer and this is a challenge in particular in developed countries both for families and for the healthcare system. This conference addresses the challenge and presents different approaches from China and the Nordic countries. It builds on the long-lasting cooperation between the two regions within the food and nutritional care in the framework of Food4Growth. It gives forecasts of the nature of the challenge and solutions that can address the challenge. It outlines solutions that we have identified to be the most challenging. The conference takes a closer look at the Nordic approach in relation to how eating, nutrition and food service can be dealt with in ageing societies in order to secure safe, nutritious, healthy and liveable eating solutions. It presents some of the promising results from the last decades of R&D in Denmark and China. Anna Birthe Bach, Director of internal training, Jiayi Senior Care. Visit the 5 concurrent group break out stations and get more insight and a face to face talk with the moderator at each booth. Take a look the posters and hear some thoughts on what the Nordic model can offer within the different themes. We will take notes on the discussions and provide a summary in the plenary session. Professor Bent Egberg Mikkelsen, Professor Jianqin Sun and Professor Gengsheng He.